When I watched this movie for the first time soon after its release in theaters in 1998 I had no understanding of Autism whatsoever. I just didn’t know. Now, thirteen years later, I do. And do I now think that this movie advocates for Autism? Let’s find out! The film begins with an emotionally overloaded thriller-action scene. Good start. It gives us a hint of where our hero, Art Jeffries, comes from. He is a guy of consciousness, which is a true gift for people of his craft. He acts on instinct, and because his instinct is being guided by his high moral stand, in the end he wins. What happens next is just as painful as being cut with a blade. We discover a boy named Simon, and he has an incurable condition. We find ourselves feeling for him, he appears lonely and isolated and we want to hug him. Later, when we are taken witness to his parents’ awful fate, we feel for him even more. He steps out of his school bus and his Mom is there to greet him. He then proceeds to the kitchen where he waits for a cup of soup. Here, this cup of soup is an overseen artistic detail, which is important in its placement within the movie’s script. It draws attention to what we might think of as insignificant. But for Simon who has Autism, it is important. We then find out that this is a part of his safety net, one of a few things he does every day that give him a feeling of security, those things that should not go wrong, and if they do, he will have a meltdown. Although we don’t know about that one at first, not until we later see him in a public space, surrounded by intolerable, for him, noise and strangers he has never seen in his life. Then a meltdown happens. In retrospect, I think that particular scene was done well. It did show Simon’s ultra sensitivity which is a part of his condition. He also wandered off, which is another peculiarity of Autism, but let’s now rewind a little. Simon again comes out of his school bus and there’s no one there to make him a cup of soup. This is when we know that something went terribly wrong. It isn’t clear for me what strikes here the most, the murder of Simon’s parents or the fact that the child has been left alone in this world at hands of a hit man who works for someone who works for the government. The conspiracy trail in the movie seems to go somewhat over the top, but it also provides a dynamic background for developing a few sub-plots and introducing a few ideas that have previously been explored in such productions as Rain Man. For instance, the movie is drawing attention to Simon’s outstanding intellectual abilities. While generally being a nuisance, it is also typical of people with Autism. Here Simon is a savant who decrypts a government security code. Or the ability to bond contrary to a misconception that Autism annuls that ability in a person. Simon finds a friend in Art and adapts to his foster family. In general, the movie covered basic keywords for Autism without going too deep into each one of them. 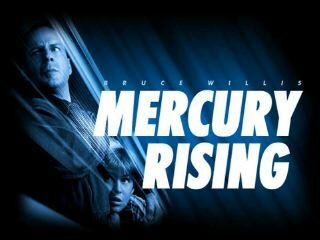 In 1998, Autism was still an understudied subject, and rather controversial as well, hence in my opinion the subtlety of hints to the condition in Mercury Rising, which now in turn brings me to the title. Today considered an offbeat topic and stirring lots of heated debates in educated circles, mercury poisoning is a chemical hazard and a growing threat. Intentionally or not, the movie’s title alludes to this threat. Mercury Rising reads as a pointer that due to the increased exposure to mercury, Autism is currently on the rise. In 1998 though, I didn’t know that. Great movie. It made me not want to find out what can happen if my children’s Autism becomes a matter of national security.